We know. We know. Dentists are fed up with throwing money at marketing with limited results. They have been disappointed time after time. BUT… the competitive nature of the dental industry means it is vital to find a marketing group you can trust to help you find your rightful place in the dental landscape. Choosing the right marketing company for your dental practice will go a long way toward determining the practice’s long-term business success. No matter how large or small your dental practice, it is important to get marketing advice from someone who is reputable, demonstrably accomplished, and can lay out a plan that will allow you to grow by attracting the patients you want. Dentists want a marketing expert or group of experts to do the actual work. Dentists want a marketing expert or group of experts with knowledge of dentistry. You want to work with developers of content who understand your practice philosophy and unique personality, have detailed knowledge of dentistry, and are dedicated to understanding the needs, wants, and concerns of patients so your Web presence and other advertising engages them on the emotional level. You want to be recognized as having the answers to patients’ concerns. 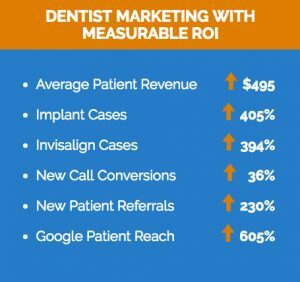 Dentists want a system of tracking marketing ROI and more. You want to have a system of tracking new patient calls. How many come in and when? What specifically motivated potential patients to call you. Which aspects of your marketing are working best? Which brand messages? Which niche services? And wouldn’t an automated call tracking system be amazing? What if it tracked how well your team members handled each call and identified the training or information they need? Dentists want significant ROI from their marketing investment. You want to be assured that you will have significant return on your investment within a reasonable period of months so you are not wasting your money and precious time. If the marketing program is not providing the expected benefits within a period of 6 to 12 months, you want the marketing people you work with to be on top of advising changes…or even agreeable to termination of their marketing services if this is what you want. Dentists want to enjoy the collaborative process and have peace of mind. You want to work with people who understand the demands of your day and are happy to collaborate with you during evening and weekends. You want to work with people who really listen to you and will promptly address your concerns. You want to develop relationships of trust. You want communication from your marketing group so you know the work is getting done and the effectiveness of this marketing to date. You want the peace of mind that keeps you from second guessing and worrying so you can go about doing the dentistry you love doing most and have time for your family, friends, and a balanced life. Do you want to grow or maintain the vitality of your practice? You are in need of a marketing program … no “ifs”, “ands”, or “buts.” It is a competitive, moving, digital world. If you are seeking a new marketing company that understands and addresses what Dentists want, we invite you to give us a call. Is the budget for your marketing a concern?